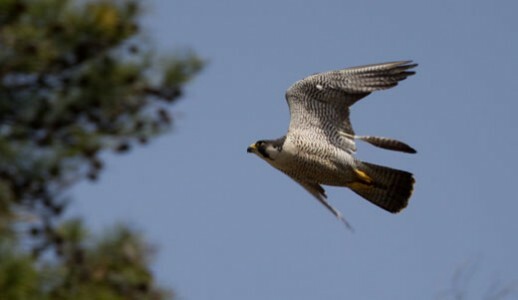 The peregrine falcon is perhaps the best hunter of the falcon family. It hunts in wild uplands and rocky coasts, scanning the landscape for prey with its exceptional eyesight. Their eyes are larger and heavier than human eyes and they can spot prey on the ground from a great height of 300m. Soaring through the sky on broad, pointed wings, the streamlined peregrine falcon is a most impressive sight as it hunts down small birds. The force and impact of its breathtaking ‘stoop’ – a sheer, high-speed dive – is often enough to kill a victim outright while still in mid-air. The peregrine’s courtship involves the male passing food to the female, often when in flight. To make this manoeuvre possible, the female will roll over when flying to take the offered food from his talons. Peregrine falcon chicks mature quickly. They have tremendous appetites and double their weight in just around 6 days. At three weeks of age they are already around 10 times their size at birth. The male peregrine is called a ‘tiercel’ because it is a tierce (one third) smaller in size than the female. Peregrines will often return to the same eyrie (nest) each year. During the Second World War peregrines were deliberately shot down in case they caught carrier pigeons which were delivering messages. Today, the main threat to peregrines is chemical pollutants, which they ingest from their prey and are highly sensitive too. The introduction of pesticides such as DDT saw numbers in Britain decline considerably. These poisons do not break down in the environment. Instead they accumulate in the food chain and birds such as falcons inevitably take in large quantities of such toxic substances. This greatly diminished their breeding success. However, restrictions on the use of agricultural chemicals and legislation to protect the species mean that numbers have now begun to recover. Range: Europe, Asia, North and South America, Africa and Australasia.